The busy travel season will soon be upon us with spring and summer vacations, graduations, weddings and family reunions. Many aging seniors want to attend these special events, but for some, travel can be tricky – whether it’s because of mobility issues or just the anxiety that comes with making a long-distance trip. Additionally, if you are the adult daughter or son caring for your aging parent, you may feel a bit uneasy about them making the trip alone. At FirstLight Home Care we completely understand. Traveling can be hectic and stressful at any age, but for senior travelers especially, FirstLight offers a Travel Companion Program to help make their trip possible and enjoyable. Peace of mind to the traveler and to the family. Our extraordinary senior caregivers provide exceptional care and companionship during your trip or your elderly loved one’s travels. Our caregivers help to get you to your destination, then home again, and we can even help throughout your entire stay. Safety and security. Our caregivers make certain your travel is as safe and stress-free as possible. As your personal travel companion, we will help with transportation assistance throughout every leg of the trip. We are there to help with airport check-in and ticketing. We will manage your luggage, assist with getting through security or customs, and we will help navigate ground transportation. Planning and preparation throughout the entire trip. Our travel companion program can also help throughout your entire stay. We provide local transportation or help you maneuver through public transportation. We also are there to help the senior traveler attend special events, sightseeing tours, shopping excursions or whatever activity they’re interested in doing. Comfort and companionship. Throughout the trip, we can assist with personal needs including bathing, feeding, hygiene, medication reminders, dressing and much more. Temporary respite for the family caregiver. If you, as the primary caregiver, are traveling instead, FirstLight can provide professional care in the home of your aging loved one. 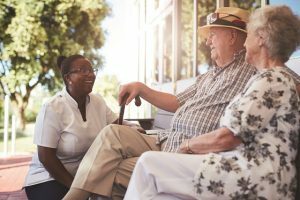 Our Respite Care services can provide a short break for you while we assist your loved one the with activities of daily living, maintaining a high level of companionship and safety while you are away. FirstLight Home Care offers exceptional caregivers to provide compassionate non-medical home care. Whether it’s a senior traveler, an individual with a disability or someone with travel anxiety, our goal is to get your loved one to and from their destination safely and comfortably. We will assist them with every step of the way, while also helping them maintain some independence. Contact us today for travel companion rates in your area, and to see how we can help.